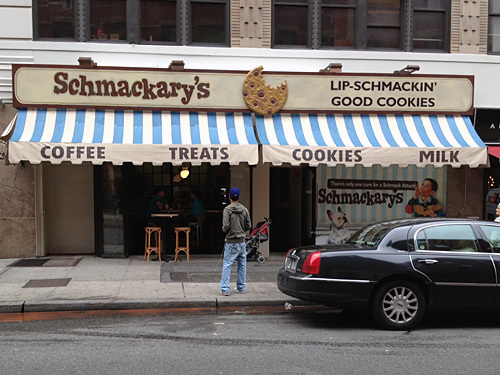 Schmackary’s has officially become my new favorite place to get cookies since the Treats Truck left Midtown. They just opened a couple weeks ago, and in my first visit, I was going to get something pretty standard, like chocolate chip, to be able to properly judge based on familiarity. But, apparently I’m really attracted to buttercream frosting, because instead I went with cookies covered in it. And, it’s amazing, by the way. The carrot cake cookie (left) was on the seasonal menu and included shredded carrots, sweetened coconut, walnuts, cinnamon and topped with buttercream frosting. They felt pretty heavy, as far as cookies go. They 100% tasted like the best carrot cake ever, but more dense and in cookie form. The hint of sea salt really brought out the flavors in the cookie. 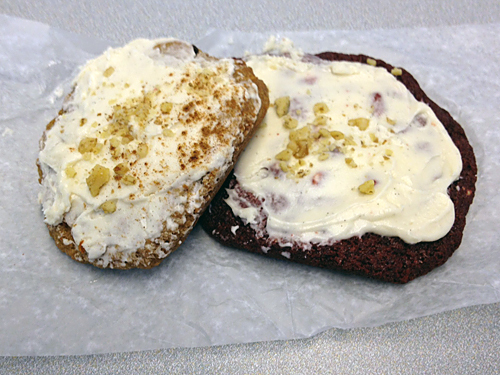 The red velvet cookie (right) — deep red cocoa, white and semi-sweet chocolate, topped with walnut buttercream frosting — was from the modern cookie classic menu. I thought the white chocolate chips were extraneous, and I’d prefer these cookies without ‘em, but otherwise I’d order this over actual red velvet cake any day. I would have loved the hint of salt that the carrot cake cookie had. If you’re super cheap and don’t want to spend for fresh cookies, Schmackary’s still has you covered with discounted day old sweets (2 for $2). 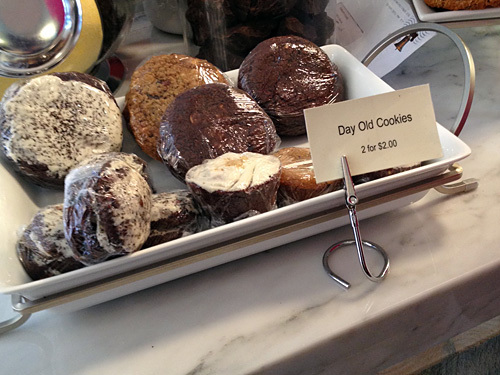 If you’re willing to pay regular price, one cookie will run you $3.75, but they’re less if you buy in bulk: two cookies are $5, five for $10 and 12 for $20. So, grab some friends to take a walk west. Sooner rather than later, I plan to walk all the way back to take in some more standard cookie options (unless I get derailed again! ), and I expect it’ll be well worth the trip out of bounds. Posted by Rachel Goldner at 1:34 pm, May 29th, 2012 under Schmackary's, Sweets. I’m glad someone took over that space, even if I’m not a sweets person. Walking past an empty rundown shop for a year sucked. I hope they do OK.
I’ve tried their chocolate chip and oatmeal raisin. Both legit. They often come warm straight from the oven. Also, the cookies are quite large. So $3.75 wasn’t outrageous. I’ve had their classic chocolate chip, cookies & cream, red velvet, peanut butter cup, chocolate duet, and maple bacon cookies…yes, 5-star General sweet-tooth here. I like their red velvet & maple bacon the most so far even if it isn’t strong in bacon. I haven’t bought less than 2 cookies so $2.50 a cookie is fine. 3.75 and I should be going to Levain, still my fav instead. I was just going to ask how this stacks up to Levain. They seem to have more unique flavors but the size leaves a little to be desired in terms of value. Just tried the chocolate chip and was so happy I did. It is certainly not the prettiest cookie on display, but it has a great chocolate to dough ratio. Also, every once in awhile you will get a slightly salty bite, just like home made. I love that in a chocolate chip cookie. There seems to be a difference in pricing. I was charged $2.75 for the standard size chocolate chip cookie. The small ones were $1.50.